Fished a small mountain stream last year and wasn't having too much luck. Saw a small trout slide under a big rock as I tried to sneak up on a little pool. Couldn't entice it out with anything and was about to move on when I spied a "1,000 Legged Worm" crawling near the pool. Decided to pitch it in and see if there was any reaction. As soon as it came even with the protruding edge of the rock, the trout shot out of there, snatched the worm and returned to it's rocky lair before I could hardly blink. A little further upstream, found another worm, and repeated the scene with the same results. Filed that away for future use and the attached creation is the result of my poor attempt at an imitation "1,000 Legged Worm." Just finished yesterday; so, will have to give it a test and see how it does as soon as we get some rain in my area. Hook: Tiemco@ - TMC 9395 - Size #8 Streamer - Straight eye - 3X Heavy, 4X Long, Forged, bronze. 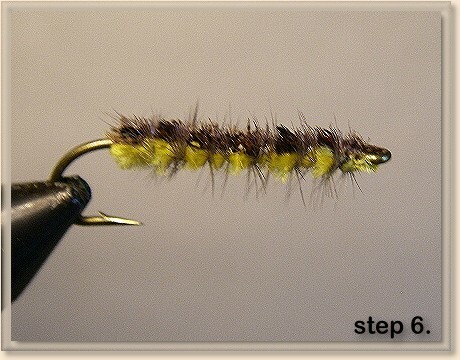 Thread: Gudebrod@ - 6/0 - Dark Yellow. 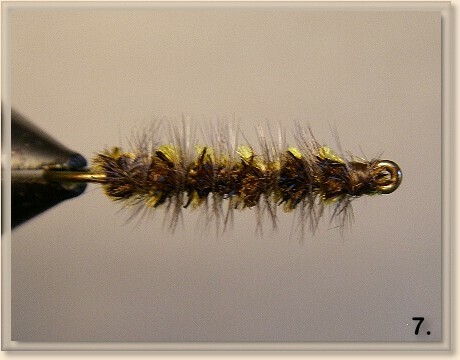 Legs: Dry fly hackle, Med. dyed dun, Size #18. 1. 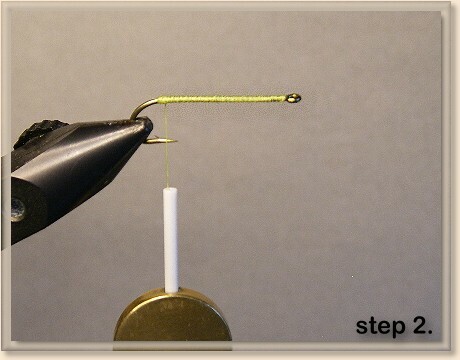 Place hook in vise and wrap thread front to back twice. 2. 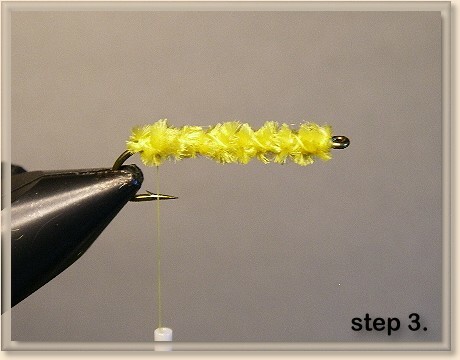 Tie in chenille at back, advance thread to the hook eye, wrap chenille to just behind hook eye and tie off. 3. 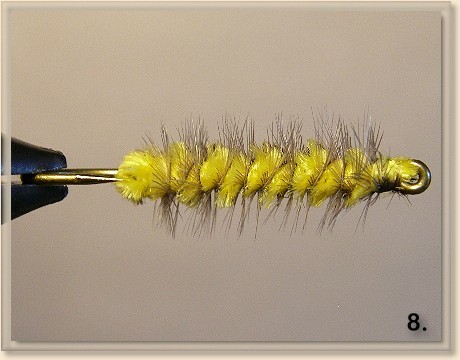 Return thread to bend and tie in hackle, advance thread to hook eye, wrap hackle to just behind hook eye using two wraps of the hackle in each section and try to place it between the wraps of the chenille. 4. 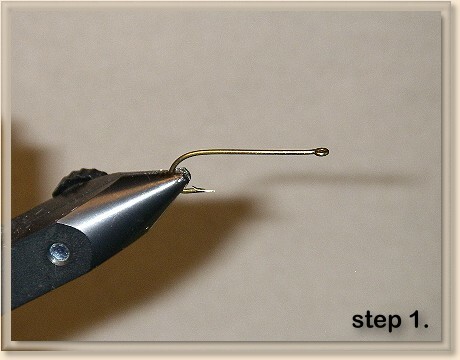 Tie off a small head of thread just behind the hook eye. 5. 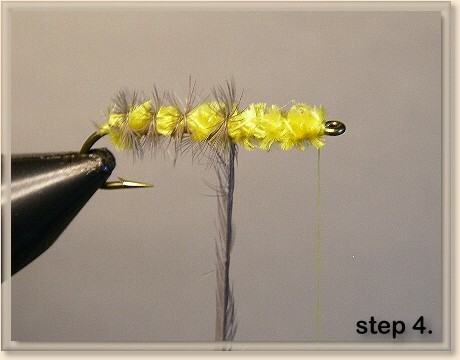 Scissor trim the hackle from the top and bottom of the fly so that the remaining hackle protrudes from only the sides creating the multiple legs. 6. Color the top of the trimmed chenille with the brown pen and a little bit down on each side.